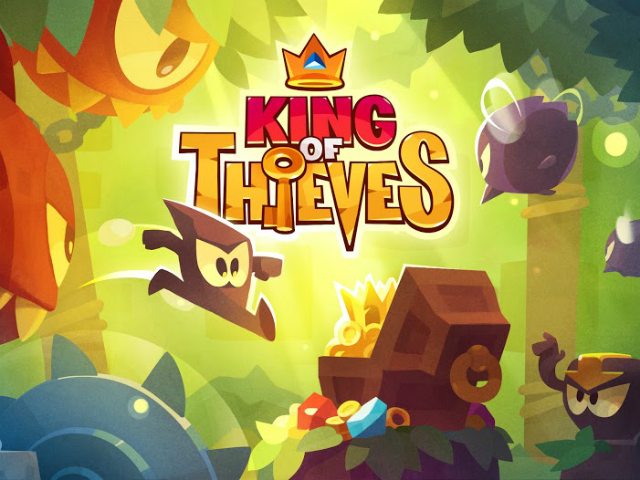 Cut the Rope developer, ZeptoLab, has announced the release of King of Thieves, a multiplayer dungeon-building game on iOS devices. The game challenges players to collect as much treasure as possible by completing single-player levels or stealing gems from others. Gamers then build and upgrade a dungeon to protect their own treasure from invaders. The side-scrolling gameplay of King of Thieves sees players spending keys to unlock each dungeon (whether controlled by the computer or another player). Once inside, their thief runs left and right automatically, and players tap to make him jump or bounce off of walls to avoid obstacles. These obstacles include cannons, patrolling monsters, spinning saw blades and more, and each time the thief takes a hit, players lose some health and must begin the raid from the beginning. If players successfully reach the treasure chest at the other end of each stage, they receive gold and experience points, and may receive a gemstone if they’re lucky (or if they’re available). Players also receive up to three stars on each stage, depending on their remaining health. Gemstones are a key currency in King of Thieves, which determine a player’s ranking in multiplayer leagues (leaderboards). Gamers can use their dungeon’s totem to upgrade and/or fuse gemstones to increase their value, but each totem can only be used a few times before disintegrating. When the totem is exhausted (and gamers have completed enough single-player levels), players pick up and move to an entirely new dungeon, with a different design and the ability to place new traps for invading players. It’s also worth noting, while a totem is upgrading gems, these gems are susceptible to theft by other players. Gamers can customize the placement of their dungeon’s traps, and can upgrade them to do more damage by spending coins, the game’s free currency. Upgrades take time to complete, but players can speed this up using premium currency. As users progress, they’ll receive some premium currency for free, as well as collectibles like leaves and mushrooms, which are used to purchase and upgrade new stat-changing outfits for the thief. A red bandana, for instance, gives him extra health. King of Thieves is not only a new property from ZeptoLab, it brings an entirely different style of game to mobile platforms. We challenged our developers to create something totally new that would deliver on our philosophy of innovation and fun. Judging by the huge positive feedback in testing, as well as by how often I’m playing the game myself, I think it’s clear they succeeded. I dare any gamer to try and steal from me. King of Thieves is available to download for free on the iTunes App Store. The game is coming to Google Play for Android devices (including Android TV support) on March 5, 2015.